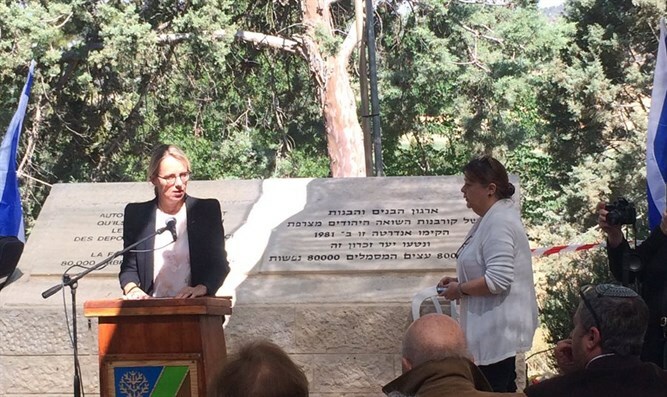 The French Ambassador to Israel, Hélène Le Gal, took part in the Holocaust Martyrs and Heroes Remembrance Day ceremony with Bette and Arnaud Klartzfeld, from the Association of Boys and Girls of the Jews who were expelled from France at a monument in the Roglit forest in memory of the French Jews who perished in the Holocaust.. In her speech, the Ambassador recalled France's responsibility for sending French Jews to the camps. "On July 16 and 17, 1942, 4,500 at the orders of French officials Lege and Bosca, French police arrested more than 13,000 Jews in Paris and its suburbs, with more than 4,000 children, none of whom returned. "Yes, France is responsible for the hunt for the Jews and for their internment in the Vel' d'Hiv Roundup; yes, France cooperated with this nefarious madness. This truth was recognized by the President of the Republic, Jacques Chirac, 22 years ago, and it has never since been denied," added the Ambassador. "Jacques Chirac said on July 19, 1995: In France, following the Velodrome d'Hiber roundup, there were raids in Marseilles and throughout France. 76,000 Jews were sent to the death camps, and only 2,500 returned. The French authorities of those days betrayed the Jewish community in France, and not a single German soldier took part in the Vel' d'Hiv Roundup" Le Gal said. The Ambassador mentioned the role of those who continue to defend and preserve the values ​​and ideals of France. "Honor was preserved only thanks to the thousands of Righteous Gentiles who saved Jews at the risk of their lives. Thanks to them, three quarters of the French Jews were not sent to the camps. The honor of France was, among others, General de Gaulle in London, the Resistance movement, the liberated French soldiers and the Jewish organizations such as the OSE, who saved more than 5,000 children." Le Gal emphasized the current challenges of Holocaust remembrance, including the struggle still needed against anti-Semitism: "Today, the challenge is to remember and to learn, through school curricula, and to finish the work of returning the property stolen from the Jews. A few days ago the French Minister of Culture, Audrey Azoulay, returned Tiepolo's painting Un berger to the attorneys of Jules and Marie-Louise Strauss who perished in the death camps in 1943. "The task of remembrance requires vigilance and determination. We must fight flawlessly against Holocaust denialץ We must be careful, in our country, France, against anti-Semitic expressions, by means of a variety of laws to fight anti-Semitism and punishing anti-Semites, because anti-Semitism is not an opinion, it is a deviation. "The equality and citizenship law of December 2016 strengthens enforcement. Protecting the Jewish community is vital, in the context in which our Republic is attacked by extremists. 4,700 police guard the 717 Jewish schools and synagogues in France. I believe that the law, the justice system, and police contributed to the 59 percent drop in anti-Semitism in France in 2016 compared to 2015," she added.